Banbridge-born Damian Tumilty (40), has been named as the executive head chef at Hastings new flagship hotel, the Grand Central in Belfast, which opened in June. For Damian Tumilty, whose kitchen credentials have seen him don his whites in top quality venues around Ireland, his prestigious new post at Belfast’s Grand Central Hotel is a welcome challenge and one that sees him realise an ambition held since childhood – to work in a top-end hotel. The Grand Central is NI’s largest and most expensively constructed hotel. Situated on the site of the former Windsor House office building in Bedford Street, the 300-bedroom venue runs to 23 floors and cost £53m to develop. Its hospitality offering includes and Seahorse Restaurant and lounge, The Grand Central Café and The Observatory on the 23rd floor, but there is no ballroom or banqueting facilities at the hotel. Damian Tumilty, who launched his career in Newcastle’s Burrendale Hotel at the age of 16, says that he has been attracted to hospitality – and hotels in particular – since his early childhood when he would make pancakes in the kitchen at home with his granny. Damian studied home economics at school and then went on to Newry Catering College where he worked his way through to his advanced diploma in culinary arts. He then spent four years at the Burrendale before moving to a post a Conrad Gallager’s former Michelin-starred Peacock Alley in Dublin. A job at the Yellow Door in Gilford brought Damian back across the border. He was still there when the restaurant became The Oriel and gained a Michelin star before closing in 2006. His next 14 years were spent at the former Café Vaudeville in Belfast as executive chef and just before the venue changed hands in 2016, he moved to the French Village on the Lisburn Road, where he worked for a year. For the last nine months, he’s been helping colleagues at Belfast’s Shu restaurant out on a casual basis. Damian says that feedback from visitors to the much-anticipated new hotel has all been very positive: “It’s a very cool place and the café in particular, has been very well received,” he reports. 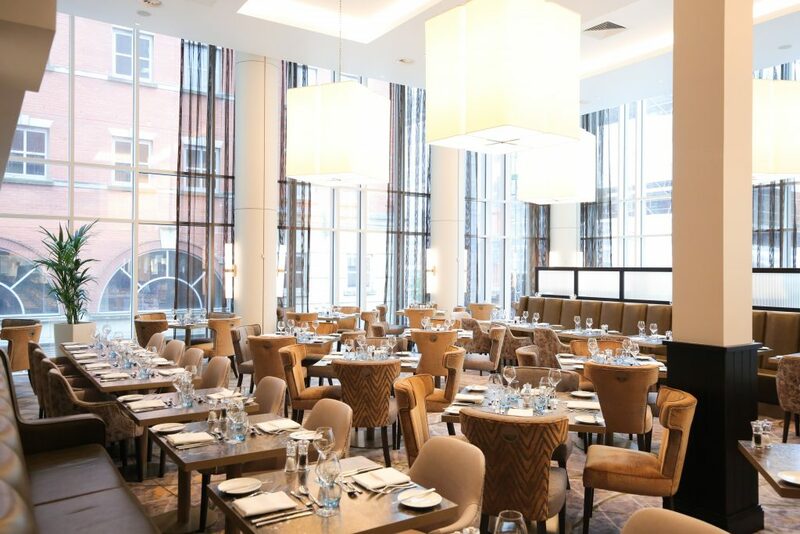 The Seahorse Restaurant at Belfast Grand Central Hotel.